Life offers an endless stream of challenges. One after another, these nonstop trials create speed bumps, roadblocks, and harrowing detours that make even the most resolute adventure seekers question their ability to succeed. Facing these often daunting tests of willpower alone rarely leads to the best outcomes. To truly succeed in life and to be our best selves, it takes the efforts of a committed team. Teams share the workload, commingling their ideas forged from each individual’s talents and abilities. Crafting creative solutions to problems and diversifying processes among members of a team to reach specific goals generates magnified results far beyond what any one individual can accomplish alone. The crew of the Starcruiser Galaxy is such a talented team. Through the unique adventures contained within the pages of their stories, the crew of the Galaxy shares their challenges, their passions, and their internal turmoil. Though they don’t always see eye-to-eye, the Galaxy’s crew shares a bond even the toughest of challenges cannot break. Together, the crew does whatever they can to support their shared vision, unique missions, and their team, even at great personal cost. Their sacrifices to save others, and each other, knows no limits, and their ability to grow as a cohesive unit is a direct result of that commitment. They are a true team with a shared vision, a family with the strongest of bonds, in space. To enjoy the Starcruiser Galaxy’s latest adventures, click on the icons to the right or in their descriptions below. Brakka’s Zombie Armada: On a routine delivery mission, the crew of a merchant ship is suddenly attacked by an armada of undead soldiers aboard a swarm of ships under the control of Commander Brakka, an ancient zombie with highly advanced technology stolen from a long-dead civilization. The crew of the freighter struggles to stop the invaders, but they are quickly consumed by the massive hoard. From one star system to the next, the zombie armada conquers all in its path, gobbling up everything and everyone who stands in its way. Despite its best efforts, the strongest galactic power, the Tioran Federation, is unable to stop Brakka’s overwhelming invading force. 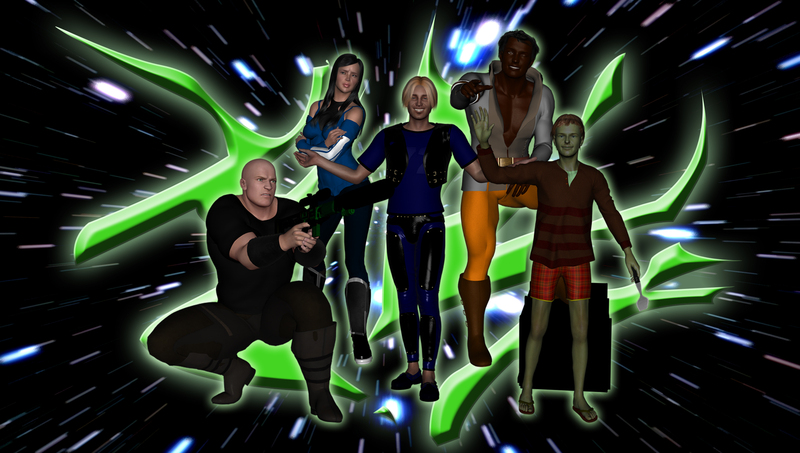 Five crew members aboard the Starcruiser Galaxy, Captain Mintax, Engineer Glenda Ritan, Weapons Specialist Steve, Programming Specialist Jonn Brock, and Communications Specialist Andre “Goober” Gu’ber hold the only key that can stop Brakka from transforming galactic citizens into his zombie minions — or lunch for his crew. As the facts unfold on Brakka’s ascension to power, the crew of the Galaxy learns of their involvement in creating the malevolent monster. To correct their mistake, the Galaxy’s crew must time travel to the past to a point before Brakka obtained his massive armada if they hope to defeat him in the future and set the universe right once again. Galaxy Chronicles: This exciting collection of 12 short stories is perfect for active individuals with limited reading time. From beginning to end, these bite-sized tales pack the robust wonders of the Starcruiser Galaxy’s journeys into fun, enjoyable reading snippets that fit into anyone’s busy lifestyle. Drone Wars – An army of murderous drones attack the Tioran Federation, killing anyone that gets in their way. Hot Lava – The Galaxy is stranded on a planet embroiled in a massive tectonic reconfiguration. Double-Rowed Smile – The newly installed, and not so gently used, auto-navigation system threatens to tear the Galaxy apart mid-warp. Drone Wars II – Jonn’s side project to create an artificial pet takes on a life of its own. Arms Deal – Steve’s attempt to purchase a new rifle from an unscrupulous vendor unwittingly unleashes a hungry beast bent on devouring everyone aboard the Galaxy. Stimugen – Hitch’s encounter with artificial stimulants nearly destroys her relationship with the crew—and her sanity. Discount Dinner – A desperate situation forces the crew to utilize a food source with unforeseen side effects. Distant Discovery – The crew is hired to investigate a distant, unresponsive government space station, but their simple mission reveals a powerful enemy force that wants to keep the station’s secrets all to itself. Damage Control – A new training program disables the Galaxy and makes the stalwart ship a tempting target for ruthless salvagers. Distant Discovery II – Technology uncovered at a secret government space station threatens to unleash a massive black hole in the heavily populated heart of the Tioran Federation. Derelict Disaster – A mission to salvage valuable technology from the wreck of a devastated pirate carrier turns sour as the derelict ship reaches out from the grave to destroy the Starcruiser Galaxy. Deceptive Cargo – A powerful force sent by a familiar foe is unleashed aboard the Galaxy with only one mission—to eliminate the entire crew by any means necessary. The Vampire Clones of Clegz: The notorious thief Xeno and his loyal partner Ju-Ka discover a source of high margin profits in the cloning business, but when their attempts to harness the regenerative properties of vampirism inadvertently unleashes a horde of the vicious creatures, their own demise is all but certain. Their only hope for escape is calling for help from the one starship in the universe whose crew seeks their eternal incarceration. With extreme reluctance, the captain of the Starcruiser Galaxy yields to the plea for rescue when he discovers his former navigator is the unwilling prototype of the vampire clones. A Very Goober Christmas: Christmas is a time to enjoy close friendships, a loving family, and a tree towering high above a mountain of colorful presents. Getting those presents under the tree could be a challenge, however, as Santa’s ship is damaged while passing through a nebula. With his ship tumbling uncontrollably through space, and time quickly running out, Santa turns to the only hope of saving Christmas – the intrepid starcruiser Galaxy and its determined crew. As the team races to save the day, an evil force bent on stealing Christmas attacks Santa’s ship. Armed only with candy canes, a generous helping of festive cheer, and a shiny string of jingling bells, the crew must find a way to repair Santa’s ship while fending off the cosmic scourge. The fate of Christmas for the entire universe rests in the hands of Galaxy’s crew. Will those on Santa’s “nice” list receive their presents this year? Or will the forces of evil triumph and seize the holidays for their own nefarious purposes? Find out in A Very Goober Christmas. The Wereghost Menace: When a wereghost invades an otherwise routine delivery mission aboard the Starcruiser Galaxy, the crew of the venerable craft must find a way to eliminate it. The task proves more complicated than expected when the true origin of the creature reveals a vile secret that a powerful government will stop at nothing to keep hidden from public knowledge. Galaxy Diaries: This exciting collection of 12 short stories is perfect for active individuals with limited reading time. From beginning to end, these bite-sized tales pack the robust wonders of the Starcruiser Galaxy’s journeys into fun, enjoyable reading snippets that fit into anyone’s busy lifestyle. Trip to Proteus – When a crewmember forms a lively bond with strangers on a space station, his new friends bring a few unwelcome surprises back to the Galaxy. No Access – A security system mishap locks the crew out of their own ship, and suspicious “clients” attempt to neutralize the objects of their paranoid skepticism. Racing Libido – The overactive libido of a crewmember forces the Galaxy to employ a unique strategy while participating in the famous Grali’k Nebulae Race. Hit and Run – When the crew is framed for a crime they didn’t commit, they must find a way to overcome ambitious law enforcement officers and clear their names. Captive Sentience – Sentient androids are enslaved by a ruthless cartel, and it’s up to the crew of the Galaxy to free them without sacrificing the potential profits from a lucrative mission. Explosive Fanaticism – The crew is forced to choose between a healthy payday or rescuing a miner under attack by their overzealous employer. Backstabbing Doppelganger – A seemingly humble merchant uses Captain Mintax’s DNA for purposes other than payment account verification. Double Date – A night out on the town for two crewmembers turns into an opportunity for their dates to enjoy much more than their pleasant company. Hot Girl – Attracting someone special at a club proves to be a monumental challenge for a crewmember when an aggressive competitor has a significant advantage. Hack Off – The infamous HACKERS group invites a crewmember to participate in an annual Cyber Intrusion Contest with potentially deadly consequences. Slimeball Merchant – The lustful desires of a corrupt merchant threatens to transform a leisurely shopping trip for one crewmember into her last. Stack Master – Captain Mintax faces a potentially crushing defeat by a cleverly ruthless competitor in an annual weightlifting championship event.